OVERSTOCK SALE! SHIPPING INCLUDED. Only $5.28 each! Create a wider, fuller look with Natural Manzanita Filler Pieces. Most Manzanita grows somewhat narrow or flat, and filler pieces make all the difference! Use 1 or 2 per centerpiece. Each piece is approximately 30 inches long. 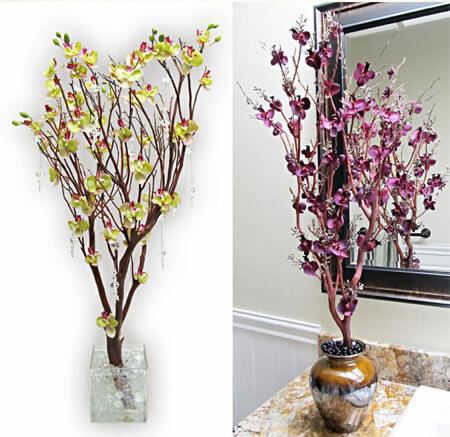 Two can sometimes be combined on their own to create a separate centerpieces, although are best suited for trimming and used as additions. Please read the Manzanita Buyer's Guide before purchasing manzanita branches. Shipping to Alaska, Puerto Rico, Hawaii, Canada, Guam and US Virgin Islands require additional shipping fees. We do not ship to Europe. Here are some photos of Manzanita centerpiece examples, using narrower natural red manzanita and filler pieces, just to illustrate how adding flowers and crystals will really fill out the display. 8 Natural Red Manzanita Filler Pieces, 24 inch (shipping included!) Sandblasted Manzanita Filler Piece, 36" Manzanita Supplements, 3 pcs. Natural Red Manzanita Filler Branch, 36"